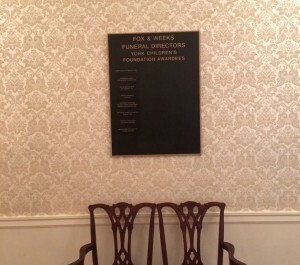 Fox & Weeks is excited to reveal a plaque at our Hodgson Chapel honoring the recipients of York Children’s Foundation grants during the past two years! The York Children’s Foundation is a national organization dedicated to providing financial support to children’s charities throughout the country. Since introducing the program in 2012, Fox & Weeks has been able to distribute more than $10,000 in grant money and support several wonderful children’s charities in our community. Each time a family purchases a casket at Fox & Weeks, a portion of the cost is donated to the York Children’s Foundation in the name of the deceased. Those accumulated funds are distributed quarterly through an application process to non-profits serving children in the greater Savannah area. Fox & Weeks is the only funeral home in Savannah that actively participates in the York Children’s Foundation program and takes great pride in being able to support the many non-profit organizations in Savannah and the Coastal Empire dedicated to supporting children. Any organization in the Coastal Empire with the primary purpose of providing for children’s needs is eligible to apply for a York Children’s Foundation grant. To qualify for a York Children’s Foundation grant through Fox & Weeks, an application must be submitted and an organization’s activities must be primarily directed towards the welfare and benefit of children. Stop by the Hodgson Chapel and have a look or click York Children’s Foundation to learn more about the York Children’s Foundation program!